The Residence of Bukovinian and Dalmatian Metropolitans is a masterpiece of European 19th century architecture and a symbol of Orthodox Church presence. The building was designed by the famous Czech architect Josef Hlavka. The complex was the seat of the (arch)bishopry of the Bukovinian Orthodox Church, which developed while this region was under Austrian Habsburg rule. 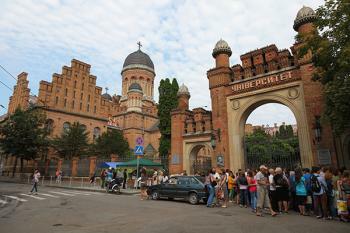 It is located in the city of Chernivtsi and is now in use as a University. Site visited July 2013. I stopped by Chernivtsi for two days on my way from Lviv to Moldova. I didn't know what to expect about this off the beaten track WHS. I travelled six hours from Lviv to Chernivtsi by train. On the train I met three young Ukrainian fellows with whom I chatted and drank beer the whole journey. It was very interesting to hear their insights about life and politics in Ukraine. In hindsight, many threats and fears those young men told me about became reality in the upcoming months. The buildings of The Recidence of Bukovinian and Dalmatian Metropolitans belong nowadays to Chernivtsi University. The complex is located in the centre area of the city. When I arrived to the gates of the university it was crowded by students who were enrolling for academic year. There was 100 meters long queue in front of the gate and the guards let the students in to the courtyard. I didn't find a way how to pass this crowd and the guards so I decided to explore the centre of Chernivtsi and come back later. Chernivtsi itself is a charming city with its art nouveau and baroque architecture. I recommend to include it to an itinerary if visiting Lviv or travelling around Ukraine. The highlights include for example central square with city hall and museum of fine arts, theatre square with drama theatre, old Bristol Hotel and Kobylyanska pedestrian street with its restaurants and cafes. In the afternoon I went back to the university. The queue and the guards were away and the gates were open so I headed to the courtyard. There were not any signs, at least in English. A man came to talk to me in Ukrainian which I don’t understand. He took me inside the main building to the ticket counter. Neither the man nor the woman at the counter understood a word of English. I bought a ticket but I didn't get any information what this ticket includes or what parts of the complex is admitted to visit. The man escorted me back to the courtyard and left me on my own. The complex consists of three buildings. 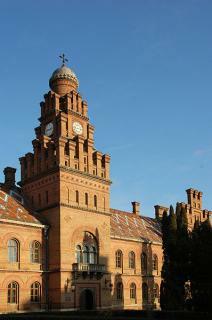 Looking from the street the first thing you notice is the monumental three arch brick gate with the text ’Universytet’. Opposite of the gate is the former residence of the metropolitans. It contains also a chapel the tower of which you can see on the right side of the building. On the left side is the seminary building with its high-domed church. On the right side of the gate is the former monastery building with the clock tower. Between the buildings is a courtyard with a well-kept and shady garden. Behind the buildings is a landscape park and arboretum which also include to the inscribed area. The buildings as a whole are beautiful and harmonious. Together with the courtyard and landscape park it is a very complete work of art. The architecture of the buildings is an interesting combination of Byzantine and Moorish influences. The colourful patterns of roof tilings give interesting details to the buildings. Apart from the impressive exterior there are some beautiful halls inside the buildings, especially in the Metropolitan Building. The problem was that I had no idea is it possible to visit them as there were not any signs or instructions at the site. The officials without foreign language skills and rude guards didn’t help either. I was able to see only the main corridor of the Metropolitan Building. Beauty and completeness of the architecture together with the elegant city of Chernivtsi makes this place worth visiting. At the same time I think that the OUV is a bit debatable. The site certainly needs some facilities for foreign visitors. While visiting Chernivtsi I recommend to do a day trip to stunning Kamyanets-Podilsky TWHS. I have visited the site just recently (July 2012). The whole residence is located at the end of University Street. Access to the place for non-students is possible with an organised group (so far Ukrainian only, costs 20 hr, 2 Euro). It last half an hour and covers short general introduction, reception hall, staircase, main assembly hall, former library, garden view from second floor and walk outside buildings. I am not sure if it is obligatory but for sure it is the only possibility to see interiors of the buildings. As a part of complex a church (Greek Orthodox) is possible to see without any additional charge. The whole visit should take approximately one hour. I've been to Czernovitz (Chernivtsi) in summer 2007 as a part of a genealogical trip. The city used to be populated with by Jews and Germans and this is still evident in its traditional Austro-Hungarian architecture. The residence has been turned into a university before WWII and it is certainly one of the most fancy universities I've ever seen. Do know that a visit to the university is only possible one hour a day. This is typical of not-so-much-tourist-friendly-post-Communist Ukraine.